"How do you tablet?" Oh yes, that's Archos' new tag line when it comes to its growing number of Android tablets. Good timing since, you know, it just went ahead and released a quintuplet of new gadgets. The offerings range from small PMP-like devices with 2.8- and 3.2-inch screens to higher-end 4.3-, 7- and 10.1-inch tablets. All will ship with Android 2.2 "Froyo" and will include accelerometers, while only some have capacitive touchscreens, front-facing cameras and 1GHz processors. There's a lot more to them all -- we're talking five different devices, of course -- so we suggest hitting the break for a short rundown of each of them along with our early impressions. And don't forget to check out the gallery of hands-on pictures and videos below. Note: all of the tablets we saw were running Android 2.1 as of this hands-on, but we were promised that they'll ship with 2.2. Archos 28 ($99.99, available end of September ) - The Archos 28 is really no surprise, but it's certainly the baby of the bunch with its 2.8-inch, 320 x 240 resolution resistive touch display. (Note: all the product names correspond to the screen sizes.) With 4GB of storage, it's clearly meant to be a WiFi-equipped PMP device of sorts, as it supports a number of video (MPEG4, WMV, MPEG2, etc.) and music formats. It comes with a new Archos music application that's got a pretty nice looking UI with album art. Speaking of applications, all of the tablets come with Archos AppsLib -- there's no Market access or Google apps preloaded thanks to Google's restrictions. The little thing does have an accelerometer and a 800MHz ARM Cortex A8 processor, though, so it can handle a bit of gaming as you can see below. Archos 32 ($149.99, available mid-September) - With 3.2 inches of display, the 32 is slightly bigger than the 28, but it also packs 8GB of storage and adds a bit more functionality. It's got a camera on its back end that can apparently record 720p video. Furthermore, this guy has a composite port on the bottom for hooking it up to a TV. Both the 28 and the 32 are on the smaller side for browsing the web and typing in URLS, but that's not to say it can't be done. Archos 43 ($199, available mid-October) - The .35-inch thick Archos 43 will eventually replace the Archos 5, and given that it's slimmer and more powerful, we don't see too many arguing about that. Though this one doesn't have a capacitive display like the larger Archos 70 and 101, it does sport a 1GHz ARM Cortex A8 processor. We fired up a racing game and found the accelerometer navigation to be pretty accurate. The camera located on the back is capable of recording 720p video. Sure, it's probably no Dell Streak competitor in terms of hardware, but it'll run Froyo when it ships and be almost half the price. Archos 70 ($274.99, mid-October) - Sure, the Archos 70 is more expensive than the previous Archos 7 Home Tablet, but we'd be willing to shell out the extra cash for the added functionality. The 70 is similar in form factor to the Home Tablet -- it's just .4 inches thick and weighs only 11 ounces -- but it's now got a capacitive screen, accelerometer and will have Android 2.2 when it ships. That's pretty every single thing we asked for when we reviewed the 7 Home Tablet. The 70's screen was obviously much more responsive and the accelerometer was quick to adjust an e-book. Unlike the 43, the 70 doesn't have a camera on the back, but it does have a front-facing VGA cam that apparently will work with some preloaded video chat apps. This one also has USB and mini-HDMI out ports. Archos 101 ($300, mid-October) - Of all the Archos tablets, we're probably most excited about this 10.1-incher. Form factor-wise, the .5-inch thick tablet is plenty thin, and at .93-pound, it felt really light in hand compared to the iPad. The 1024 x 600-resolution, capacitive touchscreen was responsive and the 1GHz processor gave it enough power to play a 720p video. Like the 70, it has a front-facing VGA cam as well as USB and HDMI ports. It's also got a kickstand on the back that allows you to prop it up at a nice angle for typing on the on-screen keyboard. Obviously, there's a number of more Android tablets hitting soon, but this one definitely seems like a new contender in our book. DENVER, CO--(Marketwire - August 31, 2010) - ARCHOS, an award-winning technology innovator and leader in the portable media player market, today announces five new Android-based tablets. From the ultra affordable and ultra portable ARCHOS 28 and 32 Internet tablets, to the multi-media marvel ARCHOS 43 Internet tablet, and the wide screen ARCHOS 70 and 101 internet tablets, ARCHOS' new range offers a combination of super-fast web-browsing, games, eBooks, social networking and other apps alongside HD video and music in a very slim-line design. The ARCHOS 28 Internet tablet and the ARCHOS 101 Internet tablet, the flagship products of the range, are bringing innovation to the Android world. The ARCHOS 101 Internet tablet offers a unique design including the latest technology. This tablet has the advantage of a connected Android device that adds very fast web browsing and HD multimedia experience. The 10.1'' high-resolution screen is nestled in a very slim and light form factor tablet, enabled through a patented construction process. 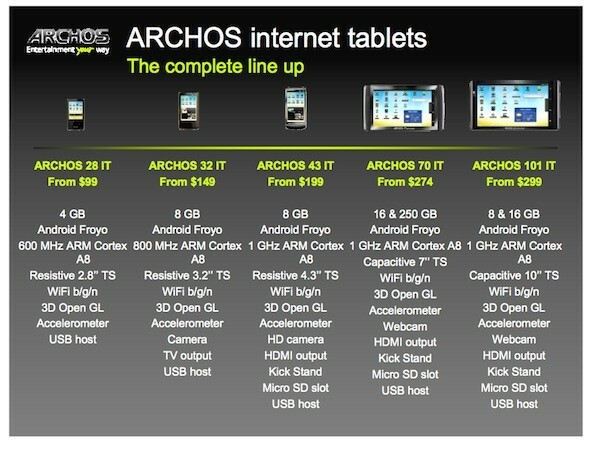 The ARCHOS 28 Internet tablet is the first Android player below $100. By introducing a connected device at such a low price, ARCHOS revolutionizes the portable music player segment. ARCHOS has developed four unique Android applications for video, photo and music with the support of 3D cover animations to allow users to keep a digital experience as simple as it should be. A patented construction process, which uses an over-moulded PVD stainless steel structure, has enabled ARCHOS to redefine the tablet form, with devices that are smaller, thinner and lighter, making the tablet even more portable. The ARCHOS 101 Internet tablet is just 0.47" thick and weighs only 15.87 ounces, yet offers a crisp, high-definition 10.1" capacitive multi-touch screen. With the adjustable kickstand, users will always have the best position to tap out emails, view a movie or enjoy the photo frame application. Using the device is designed to be both easy and intuitive. Featuring a powerful 1 GHz processor, high-speed WiFi-n technology and sleek high-resolution screen, the new Android-based tablets offer a fast and enjoyable PC-like web browsing experience. Users can access the entire internet thanks to Android's support for Adobe Flash™ 10.1 player. A built-in webcam on the ARCHOS 70 and 101 Internet tablet means users can make video calls to family and friends. In addition, a new feature in the Android settings menu means that the devices can also be tethered to a 3G phone via Bluetooth or USB for Internet connectivity when on the move. With ARCHOS' heritage in high-quality portable multimedia players, the Internet tablets offer consumers a full multimedia experience, with 720p HD video playback as standard, whether from a user's movie collection or streamed from YouTube. Unique Android multimedia applications designed by ARCHOS will allow the end user to enjoy all his multimedia content. The HDMI TV output offers the best Android, multimedia and games experience on your TV. The tablet can be used as a game pad for your TV thanks to the built-in accelerometer and 3D open GL technology so users can enjoy a unique gaming experience. The ARCHOS 43 internet tablet also sports a 2 megapixel HD camcorder to capture video and photos than end user can share on the web or on the HD TV screen. The smaller ARCHOS 28 and 32 internet tablets bring the Android revolution to MP3 and MP4 players, adding a new dimension to this market. Alongside music and video playback, the low-cost, pocket-sized devices starting from $99.99 now offer email, web browsing, music and video streaming, 3D gaming, eBooks, social networking and other entertainment, productivity and information-based apps. The ARCHOS 28 and 32 internet tablets feature music, video and photo applications, developed by ARCHOS, enriching the user experience with smooth browsing through the album covers and with widgets added to the home screen to give instant access and control to media. These unique Android applications allow users to amplify their digital experience. The devices are also compatible across the major music and video formats, so there's no need for conversion or the inconvenience of dedicated software support. A simple drag and drop from your computer is all that's required. The A32 internet tablet also includes a camcorder for video and photos to capture the greatest memories. Users can upload videos and pictures to the web or share via social networks. With WiFi connection, users can surf the Web at the speed of a computer thanks to the speedy processor. The Internet browsing is also faster than ever; users can adjust the page size of an article with a simple double-tapping or rotating the ARCHOS and the screen will flip into place to display the entire page's width. There's also an email application so you can stay in touch with all of your friends. The AppsLib store, with free and paid apps, will make sure you access and directly download custom sized Apps to fit your lifestyle. Games, books, music, social media, recipes, news and sports are now a click away. ARCHOS tablets can become an eBook reader, with literature classics, the latest magazines or favorite comics available to download and read wherever you go. A wide range of games, using 3D graphic acceleration, are also available. From the classic Sudoku to the fast-paced racing games, user will immerse themselves in fun games enjoying the comfort of sharp and large screens or using the device as a steering wheel. Available in September at 4GB, with a recommended retail price of $99.99. Available in September at 8GB, with a recommended retail price of $149.99. Available this fall at 8GB with a recommended retail price of $199.99. Available this fall with a recommended retail price of $274.99 (8GB) and $349.99 (250GB). Available this fall with a recommended retail price of $299.99 (8GB) and $349.99 (16GB). ARCHOS released the first pocket-sized HD-based MP3 player with the Jukebox 6000 in 2000 and since that time has revolutionised consumer electronics devices. The company invented the portable media player in 2003 and was the first to bring television recording, wireless and touch screens to Portable Media Players. ARCHOS have also introduced the Internet Media Tablet range -- the 5, 5g and 7 -- offering users instant, uncompromising access to the internet, media content and TV. Established in 1988, ARCHOS has offices in the United States, Europe and Asia. ARCHOS is listed on Euronext Paris, Compartment B, ISIN Code FR0000182479. www.archos.com.